Twenty-five  street-traders, informal workers, civil society leaders, community advocates, legal practitioners and community leaders participated in SPACES FOR CHANGE’s [S4C’s] one-day training, ‘Street-traders and the Law’ held on August 2, 2016 in Lagos. 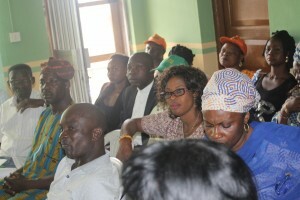 The majority of the participants were executives and members of the Federation of Informal Workers of Nigeria (FIWON). The union is comprised of member associations like the Frozen Foods Sellers Association of Nigeria, Hairdressers Association of Nigeria, Okada and Keke-riders Association of Nigeria, Automobile Mechanics Association of Nigeria, Video Film and Producers Association of Nigeria and so forth. Sequel to the July 1, 2016 ban on street-trading in Lagos State, predicated on the Lagos State Street Trading and Illegal Market Prohibition Law 2003, hundreds of street-traders and informal workers have been arrested, detained and their goods destroyed by the Lagos State’s quasi-security squad, Kick Against Indiscipline (KAI) for hawking wares in different parts of the metropolis. The arrested traders may face a 6-months jail term, or pay N90, 000 fine, or both. The one-day training for street-traders and informal workers builds on Spaces for Change’s preliminary assessment of the 2003 Law which revealed several provisions that appear arbitrary, obsolete and insensitive to current social and economic realities in the country. If unchecked, the law would infringe on the rights of millions of street traders and those engaged in informal trading across the state who depend on the earnings from street-trading for their daily sustenance. 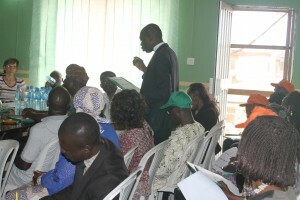 Presentations made by Spaces for Change’s legal team – Victoria Ohaeri, Aizighode Obinyan, and Godwin Ogla ­– highlighted the scope of the range of laws regulating street-trading in Lagos State such as the 2003 Street Trading And Illegal Markets (Prohibition) Law and the 2012 Lagos State Road Traffic Law (LSRTL). They also clarified the scope of powers vested on enforcement agencies like the KAI, the Lagos State Traffic Monitoring Agency (LASTMA), the Police Divisions within the state, and local government authorities. Participants learned about how the 2003 law broadly defined street-trading, the aspects of street-trading that have been criminalized and the penalties imposed. For instance, the 2003 Law targets traders of goods and services whose trading is done daily or occasionally, or in a fixed place or by itinerant hawkers. The various penalties imposed range from seizure of goods by authorized persons, to the forfeiture of the seized goods to the State. The State is vested with the authority to sell the goods and deposit the proceeds in its treasury. Traders caught risk a jail term of 6months to 1year imprisonment with hard labour or fines of #5,000.00-#15,000.00, among others. There is also a requirement for the prompt payment of fines, including penalties for third parties’ interference or obstruction of justice. As the above shows, the 2003 Law as currently framed, has grave implications on the enjoyment of human rights, especially social and economic rights. Beyond prohibiting street-trading, or exhibiting any goods, wares, articles offered for sale, it empowers designated state authorities to seize items, and have those items sold or disposed of in any manner described by the deputy governor. The law also requires arrested street-traders to forfeit their goods, whether or not the owner has been convicted of any contravention. Not only that, the law extends to buyers of those goods or wares, and those who are deemed as obstructing enforcement agencies from effecting arrests and seizure of goods. Some other sections require on-the-spot payment of fines, while criminal summons are issued against those unable to pay immediately. Chapter 4 of the 1999 Constitution of the Federal Republic of Nigeria 1999 offers strong legal protections to all Nigerian citizens, including street-traders and street-traders, whose rights may be violated. A street-trader fleeing from law enforcement agents in June 2016 was crushed to death by an oncoming vehicle. Therefore, the manner of arresting offenders may infringe on the right to dignity of the human person, which includes freedom from torture, inhuman and degrading treatment. Detaining any person beyond 48 hours without a charge brought before a court of law clearly infringes on the constitutionally-protected freedom of movement. Confiscating and selling off seized wares without determining their innocence violates the constitutionally-guaranteed right to fair hearing. Such forfeiture of goods negates the revered principle that an accused is presumed innocent until convicted by a court of competent jurisdiction. We take the view that reforming the 2003 Law, especially the provisions that are unfavourable and arbitrary, is certainly in the best interest of the nation. S4C will continue to push for reforms as many states are beginning to copy the 2003 Lagos Law and using them as a basis to ban street-trading in their respective states. In addition, S4C will continue to work with collaborating organizations to challenge these laws, and equip targeted groups with the knowledge and resources they need to defend themselves from their apparently mean impositions.